The historical Buddha (also referred to as Gautama Buddha or Shakyamuni Buddha, in reference to his family and clan names respectively), was born Siddhartha Gautama approximately 2550 years ago in what is now Nepal. “Buddha” was not his name but a description of his attainment. “Buddha” means one who is awake. Everyone has the potential to attain Buddhahood. It is the condition of transcending selfishness and seeing life as it is, not as one wishes it to be, while retaining compassion for all beings. The Sangha, in the broadest terms, is the universal community of beings who consciously seek enlightenment, whether they define themselves as Buddhists or not. The term “Sangha” is used in the Theravada tradition means only Buddhist monks and nuns, or — in the Mahayana tradition — all wisdom seekers who identify themselves as Buddhists, or — colloquially — congregations of Buddhist temples. With deepest reverence and compassion, we are here together in the spirit of Gautama, the Buddha, the Enlightened One. Life is One. We are One with the Buddha. We are One with the Teaching. We are One in the spirit of Universal Brotherhood. 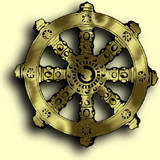 We resolve to be earnest followers of the Buddha and to dedicate our lives to the Way he has pointed out. Then, may we like him attain the noblest and most peaceful state of Nirvana. Hard is it to be born into human life. Now we are living it. Difficult is it to hear the Teachings. Now we hear them. If we do not enlighten ourselves in the present life, no hope is there that we shall be freed from suffering and sorrow in the ocean of birth and death. Let us reverently take guidance from the Three Treasures of the Truth. I go to the Buddha for guidance. I shall become One with the Buddha. I resolve that I shall each day follow the Way of Life he laid down for us to walk and awaken to his supreme wisdom. I go to the Dharma for guidance. I shall become One with the Dharma. The gates of Dharma are manifold, I vow to enter them all. The goal of wisdom is ever beyond. I shall attain it. I go to the Sangha for guidance. I shall become One with the Sangha. In the spirit of Universal Brotherhood and as a member of the Sangha, I pledge myself to strive for the enlightenment of all beings.